NEW YORK (WABC) -- A man in Brooklyn says he videotaped a New York police officer pointing a gun at him. He says it was because he was recording a confrontation between his neighbors and police. The man says the NYPD officer first tried to stop him from taping, and then fellow officers went into his apartment without a warrant and arrested him. But it turns out the man had installed cameras inside his apartment, and they recorded the whole thing. David Rivera says he now lives in fear, staying inside his apartment where there are security cameras, and when he leaves he goes where there are cameras. All because of that face to face with an NYPD sergeant. He says at one point he thought he was going to die. "She's going to eventually harm someone, if not take someone's life," Rivera said. He's talking about Sergeant Diana Pichardo. 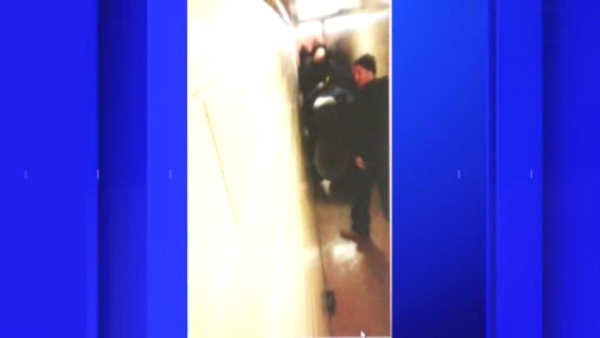 In cell phone video, he is seen staring down the barrel of her NYPD-issued weapon. In his first TV interview since the incident, he said "It seemed like all the doors opened up and all the police came up the stairs." Rivera shot video which is now the centerpiece of a newly filed federal lawsuit against the city, Pichardo, who is a 13-year vet with housing, and other officers. It all started as police were trying to arrest Rivera's neighbors in a third-floor hall of the Marlboro Houses in March of last year. Rivera said he heard noise outside of his door, went into the hallway and started recording the chaos. "I saw the barrel of the gun pointed at me, it infuriated me inside but not to the point that I'm going to interfere," said Rivera. He stepped back inside his apartment. You can hear him questioning police, who tell him to close his door. Then things escalate. Rivera said Sergeant Pichardo circled back to him and took his cellphone. They arrest Rivera. But then, as video shows, several officers enter Rivera's apartment without a warrant and search the unit. Rivera installs cameras for a living. The officers had no idea they were being filmed. Six months later in his Coney Island neighborhood, Rivera crossed paths with Sergeant Pichardo. "I immediately went on Facebook, put up a post if something happens to me in the next period of time, this is who I saw," he said. Rivera was in custody for roughly 43 hours and then was told the District Attorney was not pursuing charges and he was released. "We're looking to send a message to the community that the NYPD, the city of New York will protect the community by holding rogue officers like Sergeant Pichardo accountable for her misconduct," said Rivera's attorney Jason Leventhal. The NYPD tells Eyewitness News that Sergeant Pichardo has been named in 20 other lawsuits and because of this incident is now the focus of an ongoing disciplinary case. Rivera was facing three felony charges. He went to the CCRB, which substantiated his allegations.